Any item that can cause public nuisance or offense to any user of the stadium. Please note, No cans or bottles are to be taken out of the venue. Smoking on the premises is only permitted in designated smoking areas. 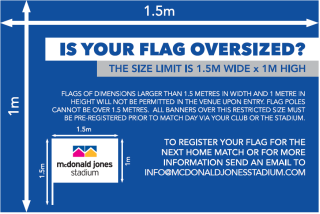 By purchasing a ticket to attend McDonald Jones Stadium (be it membership or match day ticketing) you are consenting to your image to be used for promotional material. * Please note, Umbrellas are a prohibited item for FFA events.